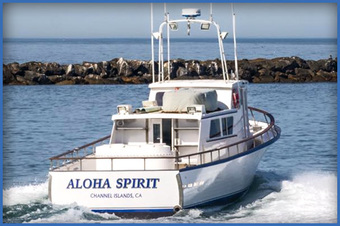 The Aloha Spirit is one of the finest local fishing boats located in Oxnard California. Skippered by Captain Shawn Steward, this 50' x 16' vessel has plenty of fishing room along the rail. Captain Shawn at the helm of the Aloha Spirit along with his crew, will make sure you have a pleasant and enjoyable trip. The Aloha Spirit specializes in limited load open party and charters. With Shawn's aggressive never give up attitude and friendly courteous crew, the will give you a experience that will keep you coming back for more.